While the cover thrusts the perfectly chiseled jaw of Jack Kerouac toward the impending reader, the guts of this masterpiece focus on the life of a young woman growing up in the thrilling yet tumultuous 1950’s of a beatnik riddled New York City. The author recounts tales of a world on the brink of changing forever, where her inquisitive spirit allows her to be drawn into the heart of what became one of the most influential cultural cyclones of our time. This is not only a look behind the man who compulsively wrote novels on his elusively famous scroll for three weeks without taking a breath. This is a literary megaphone for the voices and experiences of the other half of the population that would’ve otherwise been forgotten. If you’ve ever wondered what mysteries can be solved within the dusty archival vaults of French and English parish houses, military museums, government buildings, etc., along with what treasures of family history might be contained in long forgotten attics, then this is the book for you. If you’ve ever longed for an up close and personal look at the blackmarket underbelly of an Axis-occupied Paris during World War II, then this would also be a good choice for your summer reading list. Beyond the above-mentioned interests within the book, and perhaps even standing on their support, Shakespeare pulls his readers into his own quest to understand the world through his aunt’s eyes. His writing makes it clear that Priscilla’s experiences were not only shaped by the terrors of occupied France, but also by a culture where a young woman’s best weapon of defense was her charms. Goodman takes his readers on a true adventure into the heart of the late 1800’s, describing the struggles and successes of two unlikely opponents in their race around the world to beat the fantastical record of the then bestselling author, Jules Verne. The book might be one of the most readable historical accounts ever to grace the pages of the written medium. No side-note is left dangling, as Goodman carefully interweaves his detailed descriptions of a world now over a hundred years past into his biographical tracing of these two young female journalists. 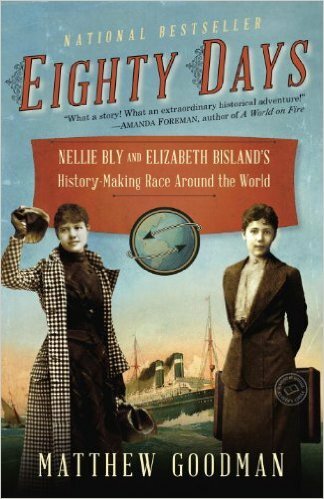 Readers have the chance to learn about the intricacies, and sometimes stench and filth, of late nineteenth century travel, meet the famous French science fiction author who inspired Nellie Bly and Elizabeth Bisland’s publishers to send them both off in opposite directions around the globe, and explore the sights and smells of each new and distant land these women traversed.